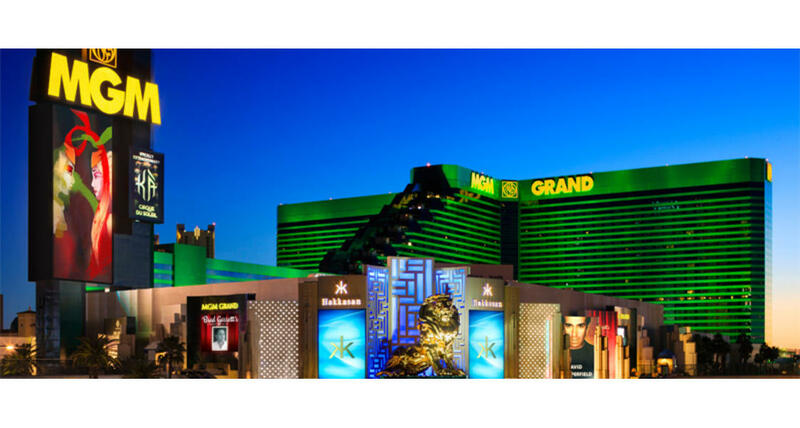 The MGM Grand Hotel and Casino in Las Vegas has been nicknamed "The City of Entertainment" for good reason. Atop a 25-foot pedestal framed by LED screens advertising the goings-on inside, the 100,000-pound MGM lion roars above the Las Vegas Strip. And, as expected, entertainment choices abound. The high-flyin' creation from Cirque du Soleil, "Kà", combines acrobatic performances, martial arts and pyrotechnics. The 16,800-seat Grand Garden Arena hosts performances by international superstars , championship boxing and nationally-televised awards shows; David Copperfield often headline the more intimate David Copperfield Showroom. Various nightclub/bars including Centrifuge & Whiskey Down, located in the heart of the hotel's casino, pulsate with pop and cutting-edge house music. A three story mega-nightclub, Hakkasan Las Vegas, features themed rooms, intimate spaces, and heart-pounding music by celebrity DJs. The excitement spills out onto the casino floor with such gaming classics as blackjack, baccarat, roulette and craps, poker room, the latest slots and a state-of-the-art race and sports book. If you have time to sleep, four 30-story towers house with almost 5,000 guest rooms, including those housed in AAA Five Diamond recipient Skylofts - a luxury, loft-style boutique hotel occupying the top two floors of MGM Grand - as well as over 700 suites and 29 private villas in The Mansion at MGM Grand. Restaurants such as Craftsteak by Chef Tom Colicchio; which join a remodeled Wolfgang Puck Bar & Grill, Michael Mina PUB 1842 and Emeril's New Orleans Fish House. More casual dining options include Hecho En Vegas Mexican Grill & Cantina, TAP Sports Bar and the MGM Grand Buffet. The District offers fast food and casual eatery options as you make your way from the casino to the Grand Garden Arena. The Grand Pool complex is just that - 6.6 acres of grand swimming pools, whirlpools and a lazy river. The Grand Spa Salon & Fitness Center features more than 30 treatment rooms, saunas and steam rooms, the steady hands of celebrity stylist Cristophe, and high-tech virtual-reality climbers and bikes. Wet Republic is a special daytime pool area that brings nightlife to the pool atmosphere! The Forever Grand Wedding Chapel has two full-service, non-denominational chapels that can accommodate up to 70 guests. Plus, the $100 million MGM Grand Conference Center offers meeting space in excess of 602,000 square feet, accommodating up to 10,000 people. Such conveniences as the monorail station, which connects nine major resorts along its four-mile route, and satellite hotel check-in at McCarran International Airport make getting around even easier.